Making decisions has been identified as one of the primary responsibilities of any manager. Decisions may involve allocating resources, appointing people, investing capital or introducing new products. If resources like men, money, machines, materials, time and space were abundant, clearly any planning would be unnecessary. But, typically, resources are scarce and so there is a need for planning. Decision making is at the core of all planned activities. We can ill afford to waste scarce resources by making too many wrong decisions or by remaining indecisive for too long a time. 3. The future, in which decisions will be carried out and evaluated. 3. Choice Activity: The actual choice among available and assessed alternatives is made at this stage. If you have followed the nature of activities of these three phases, you should be able to see why the quality of any decision is largely influenced by the thoroughness of the intelligence and design phases. Henry Mintzberg and some of his colleagues (1976) have traced the phases of some decisions actually taken in organisations. They have also come up with a three-phase model as shown in Figure I. Source: Mintzberg, Raisinghani and Theoret, 1976. 1. The identification phase, during which recognition of a problem or opportunity arises and a diagnosis is made. It was found that severe immediate problems did not have a very systematic, extensive diagnosis but that milder problems did have. 2. The development phase, during which there may be a search for existing standard procedures, ready-made solutions or the design of a new, tailor-made solution. It was found that the design process was a grouping, trial and error process in which the decision-makers had only a vague idea of the ideal solution. 3. The selection phase, during which the choice of a solution is made. There are three ways of making this selection: by the judgment of the decision maker, on the basis of experience or intuition rather than logical analysis; by analysis of the alternatives on a logical, systematic basis; and by bargaining when the selection involves a group of decision makers. Once the decision is formally accepted, an authorization is made. Note that the decision making is a dynamic process and there are many feedback loops in each of the phases. These feedback loops can be caused by problems of timing, politics, disagreement among decision-makers, inability to identify an appropriate alternative or to implement the solution or the sudden appearance of a new alternative etc. So, though on the surface, any decision-making appears to be a fairly simple three-stage process, it could actually be a highly complex dynamic process. 3. Programmed and Non-programmed Decisions. decisions can often if not always be delegated" (Barnard, 1937). Thus, the manager makes organisational decisions that attempt to achieve organisational goals and personal decisions that attempt to achieve personal goals. Note that personal decisions can affect the organisation, as in the case of a senior manager deciding to resign. However, if you analyse a decision, you may find that the distinctions between personal and organisational decisions are a matter of degree. You are, to some extent, personally involved in any organisational decision that you make and you need to resolve the conflicts that might arise between organisational and personal goals. Another common way of classifying types of decisions is according to whether they are basic or routine. Basic decisions are those which are unique, one-time decisions involving long-range commitments of relative permanence or duration, or those involving large investments. Examples of basic decisions in a business firm include plant location, organisation structure, wage negotiations, product line, etc. In other words, most top management policy decisions can be considered as basic decisions. Routine decisions are at the opposite extreme from basic decisions. They are the everyday, highly repetitive, management decisions which by themselves have little impact on the overall organisation. However, taken together, routine decisions play a tremendously important role in the success of an organisation. Examples of routine decisions are an accountant's decision on a new entry, a production supervisor’s decision to appoint a new worker, and a salesperson's decision on what territory to cover. Obviously, a very large proportion (most experts estimate about 90 per cent) of the decisions made in an organisation are of the routine variety. However, the exact proportion of basic to routine types depends on the level of the organisation which the decisions are made. For example, a first-line supervisor makes practically all the routine decisions whereas the chairperson of the board makes very few routine decisions but many basic decisions. Simon (1977) distinguishes between Programmed (routine, repetitive) decisions and Non-programmed (unique, one-shot) decisions. While programmed decisions are typically handled through structured or bureaucratic techniques (standard operating procedures), non-programmed decisions must be made by managers using available information and their own judgment. As is often the case with managers, however, decisions are made under the pressure of time. An important principle of organisation design that relates to managerial decision making is Gresham's Law of Planning. This law states that there is a general tendency for programmed activities to overshadow non-programmed activities. Hence, if you have a series of decisions to make, those that are more routine and repetitive will tend to be made before the ones that are unique and require considerable thought. This happens presumably because you attempt to clear your desk so that you can get down to the really serious decisions. Unfortunately, the desks very often never get cleared. of factors associated with it; and (2) how much certainty can be placed with the outcome of a decision. Based on these two dimensions, four kinds of decision modes can be identified: Mechanistic, Analytical, Judgmental, and Adaptive (See Figure Ill). 1. Mechanistic Decisions: A mechanistic decision is one that is routine and repetitive in nature. It usually occurs in a situation involving a limited number of decision variables where the outcomes of each alternative are known. For example, the manager of a bicycle shop may know from experience when and how many bicycles are to be ordered; or the decision may have been reached already, so the delivery is made routinely. Most mechanistic decision problems are solved by habitual responses, standard operating procedures, or clerical routines. In order to further simplify these mechanistic decisions, managers often develop charts, lists, matrices, decision trees, etc. 2. Analytical Decisions: An analytical decision involves a problem with a large number of decision variables, where the outcomes of each decision alternative can be computed. Many complex production and engineering problems are like this. They may be complex, but solutions can be found. Management science and operations research provide a variety of computational techniques that can be used to find optimal solutions. These techniques include linear programming, network analysis, inventory reorder model, queuing theory, statistical analysis, and so forth. 3. Judgemental Decisions: A judgemental decision involves a problem with a limited number of decision variables, but the outcomes of decision -alternatives are unknown. Many marketing, investment, and resource allocation problems come under this category. For example, the marketing manager may have several alternative ways of promoting a product, but he or she may not be sure of their outcomes. Good judgement is needed to increase the possibility of desired outcomes and minimise the possibility of undesired outcomes. 4. Adaptive Decisions: An adaptive decision involves a problem with a large number of decision variables, where outcomes are not predictable. Because of the complexity and uncertainty of such problems, decision makers are not able to agree on their nature or on decision strategies. Such ill-structured problems usually require the contributions of many people with diverse technical backgrounds. In such a case, decision and implementation strategies have to be frequently modified to accommodate new developments in technology and the environment. Figure IV depicts these three conditions on a continuum showing the relationship between knowledge and predictability of decision states. Decision making under certainty: A decision is made under conditions of certainty when a manager knows the precise outcome associated with each possible alternative or course of action. In such situations, there is perfect knowledge about alternatives and their consequences. Exact results are known in advance with complete (100 percent) certainty. The probability of specific outcomes is assumed to be equal to one. A manager is simply faced with identifying the consequences of available alternatives and selecting the outcome with the highest benefit or payoff. As you can probably imagine, managers rarely operate under conditions of certainty. The future is only barely known. Indeed, it is difficult to think of examples of all but the most trivial business decisions that are made under such conditions. One frequent illustration that is often cited as a decision under at least near certainty is the purchase of government bonds or certificates of deposit. For example, as per the assurance provided by Government of India, Rs. 1,000 invested in a 6-year National Savings Certificate will bring a fixed sum of Rs. 2,015 after six complete years of investment. It should still be realized, however, that the Government defaulting on its obligations is an unlikely probability, but the possibility still exists. This reinforces the point that very few decisions outcome can be considered a sure thing. 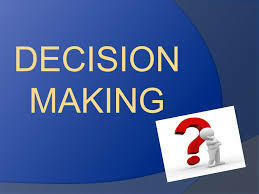 Decision making under risk: A decision is made under conditions of risk when a single action may result in more than one potential outcome, but the relative probability of each outcome is known. Decisions under conditions of risk are perhaps the most common. In such situations, alternatives are recognized, but their resulting consequences are probabilistic and doubtful. As an illustration, if you bet on number 6 for a single roll of a dice, you have a 1/6 probability of winning in that there is only one chance in six of rolling a 6. While the alternatives are clear, the consequence is probabilistic and doubtful. Thus, a condition of risk may be said to exist. In practice, managers assess the likelihood of various outcomes occurring based on past experience, research, and other information. A quality control inspector, for example, might determine the probability of number of ‘rejects' per production run. Likewise, a safety engineer might determine the probability of number of accidents occurring, or a personnel manager might determine the probability of a certain turnover or absenteeism rate. Decision making under uncertainty: A decision is made under conditions of uncertainty when a single action may result in more than one potential outcome, but the relative probability of each outcome is unknown. Decisions under conditions of uncertainty are unquestionably the most difficult. In such situations a manager has no knowledge whatsoever on which to estimate the likely occurrence of various alternatives. Decisions under uncertainty generally occur in cases where no historical data are available from which to infer probabilities or in instances which are so novel and complex that it is impossible to make comparative judgements. Examples of decisions under complete uncertainty are as difficult to cite as example of decisions under absolute certainty. Given even limited experience and the ability to generalize from past situations, most managers should be able to make at least some estimate of the probability of occurrence of various outcome. Nevertheless, there are undoubtedly times when managers feel they are dealing with complete uncertainty. Selection of a new advertising programme from among several alternatives might be one such example. The number of factors to be considered and the large number of uncontrollable variables vital to the success of such a venture can be mind-boggling. On a personal level, the selection of a job from among alternatives is a career decision that incorporates a great deal of uncertainty. The number of factors to be weighed and evaluated, often without comparable standards, can be overwhelming. To test, identify six decisions that you have taken during last one year. Check which decisions were made under Certainty, under Risk and under Uncertainty.